Our knowledge of cultivation, combined with top-notch design and styling, can take any event to the next level. It’s in our peony heart. Like the Amsterdam Pride festival, for example. For the Amsterdam Pride festival, we supplied some of our biggest, boldest peonies, such as Sarah Bernhardt, Red Charm, Gardenia, and Dr. Alexander Fleming. 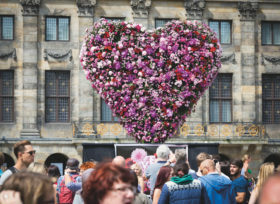 They took centre stage in Amsterdam, where a giant peony heart invited fans of love, freedom and diversity to party, peony style! Share your love with peonies at the Amsterdam canal pride. Rockstar flower arranger Jeff Leatham, with his well-known penchant for peonies, created several eye-catching designs that incorporated our fresh peonies. At the height of the festival during the Canal Parade, in which colourful party boats cruise through the canals of Amsterdam, bright pink and white peonies caught everyone’s eye. If there’s one flower that gets the party started it’s the peony!